Remember to Register early for BAM10! Platinum level tournaments rego will cut off strictly on May 13. The clock is ticking and you don’t want to miss what’s in store. This includes SFV, Tekken, DBFZ and ALL Smash tournaments. This allows us to provide a better tournament experience, particularly as these games all start Saturday morning. Make sure you have your registration in and don’t let your friends let it slide! Capcom Pro Tour, Tekken World Tour, the first major Dragon Ball FighterZ event in Australia, plus Armada for Melee and the biggest Smash4 event yet, it’s all on the line. 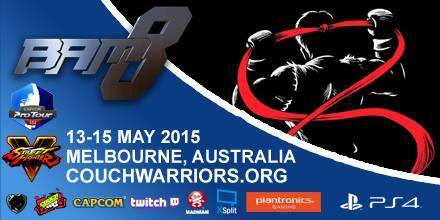 Venue registration is still only $50 but goes up to $60 on May 6, and $70 on May 18 (day of BAM10). However, you will NOT be able to register for the above games. All other games (Gold and Silver) will allow registration up to an hour before. CouchWarriors Ranbats return this March! Here are the details for this month’s ranbats. Updated Ranbat points rankings can be found here. See you guys there for an exciting day of tournament fun! CouchWarriors FINAL 2016 Ranbat- December 10 at CQ Hotel! CouchWarriors is capping off 2016 with a huge event – just like last year we’re hosting our final ranbat at the CQ hotel right in the Melbourne CBD for a one day fighting game extravaganza. Ring in the holiday season with some fighting game cheer- and we have many special surprises in store for you! The top 3 placers in our 2016 ranking battle points for Smash 4, Melee and SFV will be competing for a $250 prize bonus – with the highest point placer for each game receiving a medal and a special prize (TBA). The December Ranbat will bring extra weight- placing in December will earn you double points! (Usually 10 for 1st, 8 for 2nd and 6 for 3rd) The top two current places for Smash 4 and SFV are currently separated by three points, so do your best at the remaining two ranbats in November and December! Pre-register for the December ranbat here and put yourself in the running to win some prizes from our sponsors! 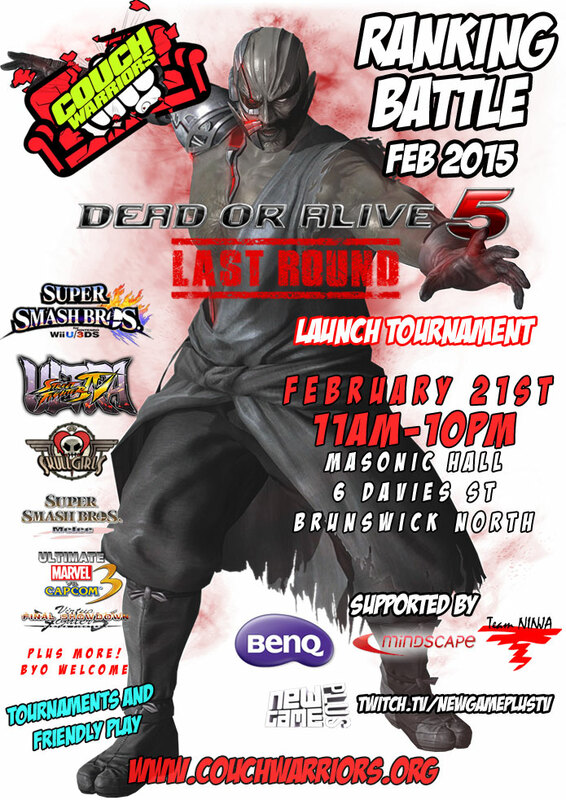 See you there for an exciting day of casuals and tournament hype – who will make it across the finish line? There is a BYOC / Sticks policy for the event. We have some available for emergency and our friendly players will often loan a controller, but we ask you to please bring your own! Also, while we have enough equipment to run the tournaments, everyone will appreciate anybody who can bring setups for casuals and DIYs. CQ Functions is on Queen St, a short walk up from Melbourne Central train Station, or Flinders St Station. CouchWarriors ranbats are back in November! The Traditional Fighters + Melee ranbat will be on the 19th of November. And we have the Smash 4 + Rivals of Aether July Ranbat on the 22nd of October. Don’t forget our December final ranbat will have prizes and medals for the ranking battle points winner- so make sure to do your best at this November ranbat as well! Check the latest points rankings here. CouchWarriors ranbats are back in July – the traditional fighters + Melee ranbat on the 23rd of July will serve as the official Qualifier in Melbourne for the Ozhadou Nationals 14 in Sydney August 26-28! Place in your respective games and receive seeding points to ease your journey into the top 8 brackets at OHN14. And we have the Smash 4 + Rivals of Aether July Ranbat on the 30th of July. CW Traditional Fighters+Melee July 23 Ranbat – Preregister by making a Smash.GG account and visit here to register. CW Smash 4 June 30 Ranbat – Preregister by making a Smash.GG account and visit here to register. We’re also very pleased to announce a partnership with Royal Stacks Brunswick– a joyous burger joint less than 300m (3min walk) from our ranbat venue on 6 Davies Street. The good folks at Royal Stacks Brunswick (800 Sydney Road) will give any of our ranbat attendees 25% off their order – simply show them the CouchWarriors ranbat event page on your smartphone- and they will apply the discount to your order! 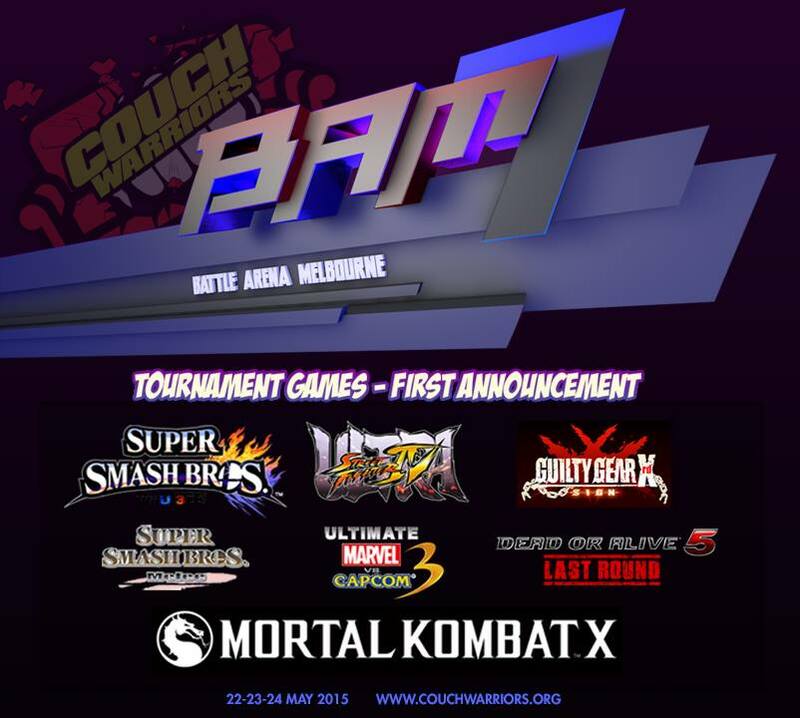 The last CouchWarriors ranbats before BAM8 are back in April! We have traditional fighters and Melee: USF4, GGXRD, DOA5LR, MKX, Smash Melee and Project M on Saturday the 16th of April and Smash 4 and Rivals of Aether on the 23rd of April. Be sure to check which weekend coincides with the games that you play, and hope to see you guys there! For full details check out the official Facebook event pages for the April 16 (preregister here) and April 23 (preregister here) events. Or hit the jump to see the full schedule for both days! Today we are announcing the first list of confirmed games for BAM7. Battle Arena Melbourne will return on May 22, 23 and 24 at CQ Functions, 123 Queen St Melbourne. This is promising to be the biggest BAM yet, as we are expanding the floorspace to take over the entire venue with all three function room spaces. Tournaments, casual games, tips and training – CouchWarriors Ranking Battles are a day long fighters festival! Newcomers are welcome as well as tournament veterans. This is the traditional CouchWarriors event since formation in 2006! Come play or BYO your setup. Enjoy some casuals or get in your tournament practice going with our structured events. The venue is a short walk from Moreland Train Station, Sydney Road Tram, and there is ample parking at the venue . It’s just off Sydney Rd, before Moreland Rd.